In Glassware > Early American Pattern Glass > Show & Tell and Kitchen > Cake Stands > Show & Tell. Here are just a few comparison photos of Jeweled Moon and Star. 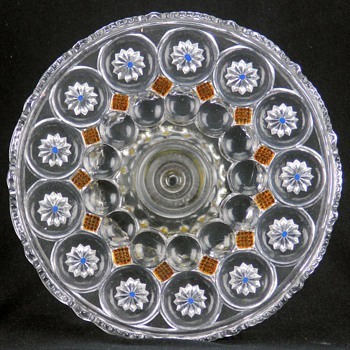 This pattern was first made in crystal, and crystal with blue and gold stains. 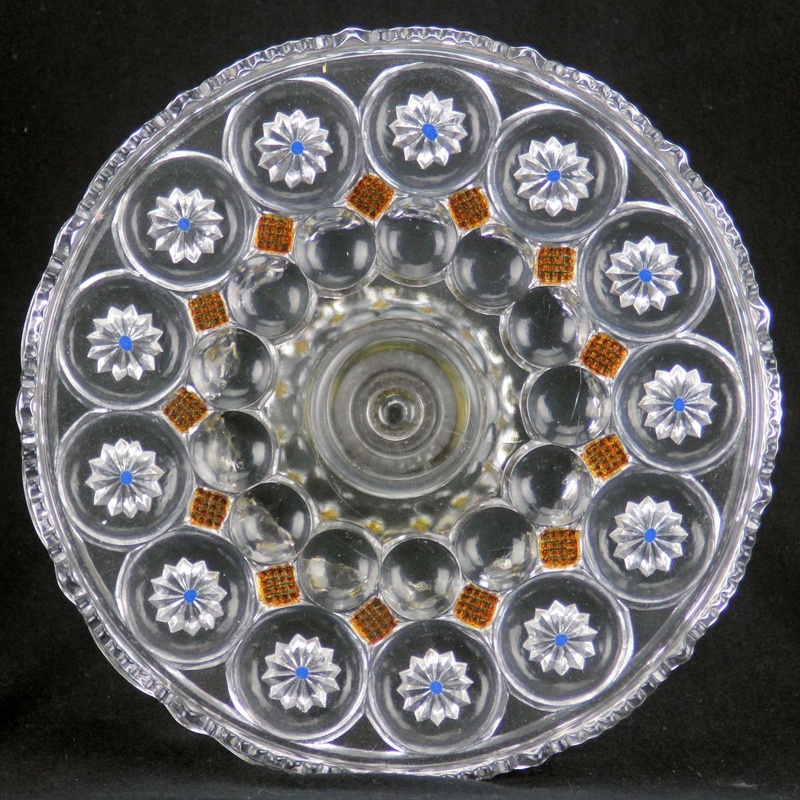 The pattern was reproduced by Phoenix Glass Company in 1929 from molds acquired from Co-Operative Flint Glass who made the EAPG pattern in 1896 and first called it 'Imperial'. The paper labels are marked Phoenix Sculptured Artware. This pattern was also later made by Kemple Glass, but Phoenix Glass was the only one to produce the milk glass w/pink. 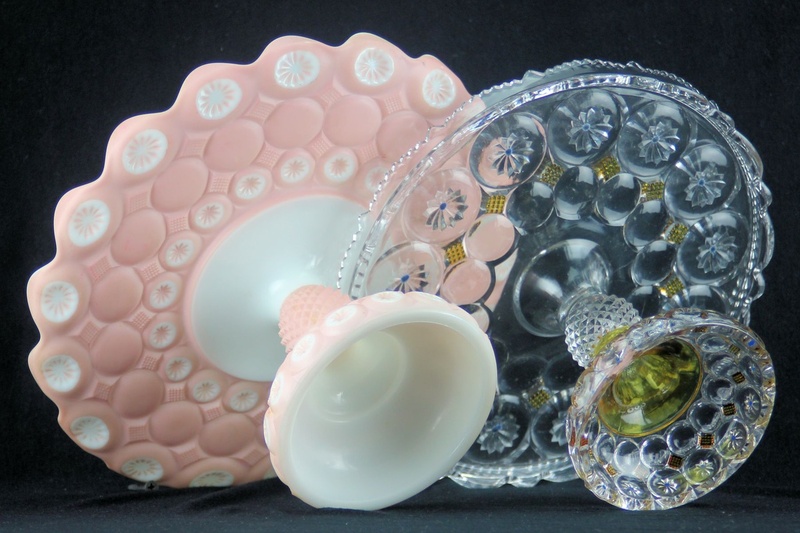 Those are really pretty :) I hardly ever see cake plates in my travels Tallcakes and you've got me looking now ! All are beautiful but that pink one is amazing! I can imagine petit fours on it. Yum! thanks Chanelle : ) Tho' pink isn't really one of my fav colors I do like the way Phoenix used color in their remake of old EAPG patterns. 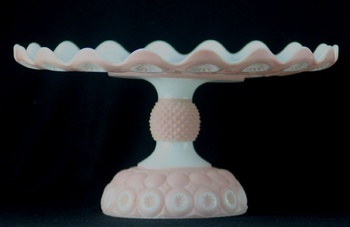 Thinkin' about maybe using the stand for SIL birthday cake with strawberry cream cheese buttercream frosting on the cake. They are just gorgeous, both of them. We will need a picture of that cake in place!! Racer you should try one of TCs recipes! Divine! I'm thinking about something like Audriana's Smash Cake; only with chocolate layers with strawberry frosting. The Strawberry Crunchies provide an intense strawberry flavor and beautifully pink frosting. I need to get a photo from the wedding photographer of the cake for my nephews wedding last month that was on a Hand Stem cake stand; rustic white buttercream frosted cake with lots of flowers for decor. Stunning post, and pics!! thanks for posting!! :) Every time I go out now I'm looking for cake plates thanks to you. lol but I don't think I will ever find any like yours. 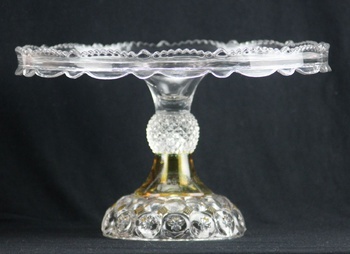 thanks loveyardsales : ) I do the same thing still & I for sure don't NEED another cake stand! All adorables but the pink...OMG!! Tallcakes, this thread reminds me I have two milk glass cups I would like to kow more about, maybe will post and ask, see if someone can help. You are So Welcome....and THANK YOU for all your knowledge you provide to us here! !